And off Matt and I went to Michigan, where it was indeed much flatter than hilly Ithaca and seemingly everything was made of brick. I only had 36 hours in Michigan before flying home to Portland, and I was excited to finally see the state beyond the confines of the Detroit airport–a lovely place, but it could be anywhere and I’d like it just as much. Finally seeing someone’s town after knowing them for a long time is exciting. Matt showed me the high school (which was enormous, despite only having 1/3 more students than my own), where he’d had his first job, and the strangely close distance between McMansions and trailer parks. And then we went to downtown Ann Arbor, home of the University of Michigan. I expected it to feel like Berkeley, and it definitely had that same cool college town vibe, with cheap cultural food and unique bookstores. Matt and I talked about how our lives would be different if we’d chosen large state schools instead of a medium-sized liberal arts one, but we can never truly know the extent of that hypothetical. I was repeatedly astonished by the number of school spirit stores, reminding me that you can tell a lot about a place by what’s being sold on every street corner. The next day, Matt drove me to the Detroit airport, the only place where I’d spent hours without ever seeing the exterior. And for the first time when I lifted into the air above the city, I had something to say goodbye to. It can’t be anywhere, because now it’s there. For more of my Firsts series, check out First Lottery Ticket and First Jail Experience, or read a guest post: First Job Post-Graduation. Isn’t Dawn Treader the best?!? If you ever make it back, a second bookstore opened: Literati. Mostly new books but a cool vibe. 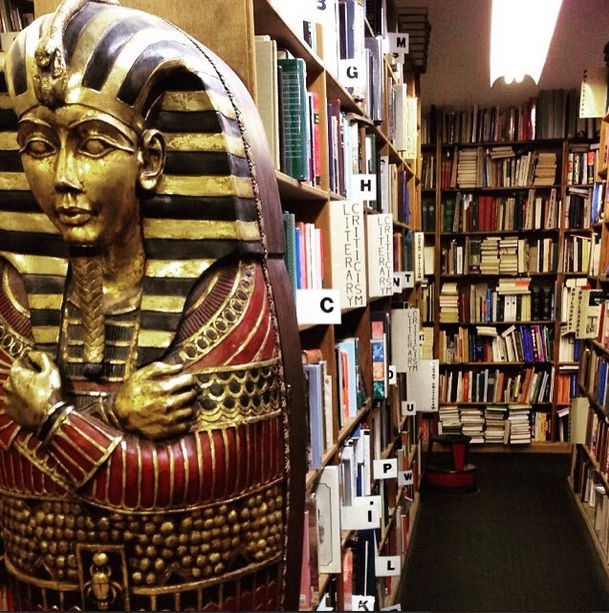 If you want to get even more lost than you were in DT, a trip to John R. King books in Detroit is a must. Think DT with 3-4 floors. Bring bread crumbs. Glad you had a good visit. I attended a rival Big 10 school in another state–I just live in Michigan–but it is intriguing to compare similarities and differences. I wonder what my life would have been if I’d accepted my scholarship to attend a small college near where I grew up…? Of course, I’m delighted with my choice of schools, as I hope you are of yours. Ah we saw Literati too! Didn’t go in but I loved what I could see from the outside. I am happy at my choice of school, but there ARE some things that I think I would’ve ended up preferring at a bigger school. But hey, you can’t have it all. Even big schools have different vibes in the towns surrounding them. I enjoyed visiting Boston and taking the train to the different universities spread out over the city. Boston’s schools definitely have different vibes between them too, although some connection because they’re in the same city. Michigan is one of those places I’ve always wanted to visit. I’ve heard it is beautiful! I wish I’d seen more of it! I’m more of a medium-oriented girl too, but I agree it would be really interesting to see how it changed. So fun that you got to go to Ann Arbor, it’s such a wonderful city! I was born and raised in Michigan (in one of the suburbs about 45 minutes north of Detroit) but I went to school at the University of Michigan and that’s where I met my husband, who is from Portland :) We decided to settle out here and Portland is awesome, but I always love going back to Michigan and especially visiting Ann Arbor. We try to make it back for a U of M football game once a year, if you ever get the chance you should definitely go to one because it’s a really cool experience – the stadium holds over 100K people! Wow, that’s a lot of people! Their school spirit is evident on the campus so that makes a lot of sense. Ah that’s great that he gets to show you around–it’s fascinating to see people’s past lives and what shaped them. My husband and I also went to a small liberal arts school (which is where we met!). We talk about how weird our lives would have been if either of us went a different way with our life choices. It seems like it would be so strange, although it wouldn’t be because they would just be the choices we did make and you just learn to live with those, right? :-) Cheers! I think about that all the time! What would my life be like if I went to a different school? Who would my friends be? We do learn to live with our choices though, since we don’t know any better. It is so fun visiting a place someone is from. They feel important, they have a story to share AND you get a little peak into part of their history. Sounds like it was fun! I moved from Michigan to DC and am a Michigan State alum. Yup, the “other” school. We have a few UofM alums in both sides of our families and I remember how beautiful then campus was and how fun the town was, even waaay back then. So glad you got to visit, Sabina! Thanks Stacy! I didn’t realize you were a Michigander. Not originally, but it was the longest place I lived prior to DC (which has been 35 years!). I’ve never been to Michigan. Sounds fun! I wish I’d gotten to see more of the state, since I had a great time seeing what I did see. It’s always fun to go home with a friend and see how they live and where they live. I didn’t get to do it nearly enough because my family lived just a half hour away from my college so I was the one that took friends home with me. Definitely! None of my school friends actually live that close to school, but I have gotten to see where a few of them live. It’s really interesting to see that side of them/their world. Sounds like a fun trip — it’s always so much fun to see a place through a friend’s eyes and see where they grew up. Definitely! I wish I could’ve stayed longer.